The Orchestra undertook their second tour to Denmark in August 2009. 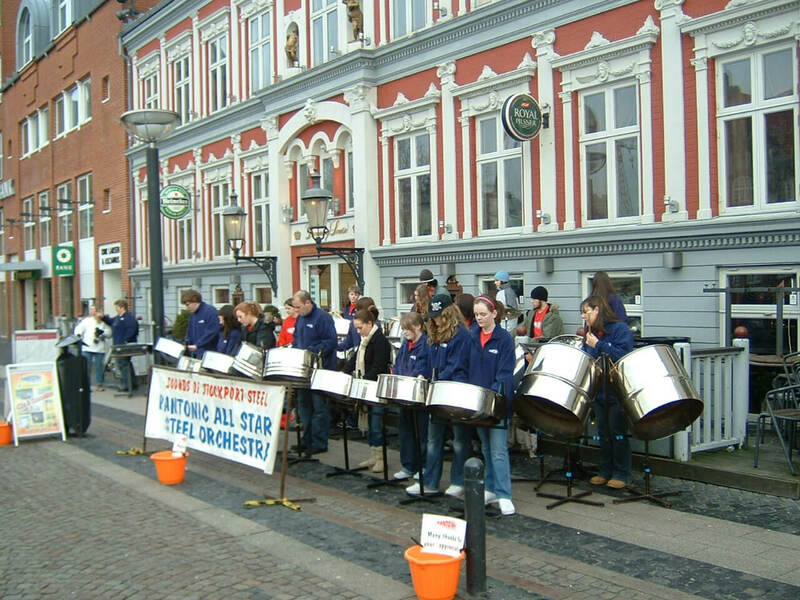 The aim was to support the Esbjerg Steelband Festival as part of Esbjerg’s Arts Festival. We arrived with Ryanair via Birmingham and Billund Airports and, having settled into our houses at Ribe Byferie, the whole group of thirty three went out for our usual first night meal and celebration of Adrian’s birthday at the Saelhunden restaurant. The following day we went by coach to the Ribe Viking Centre where we met up with the most of the other steel bands who had come over for the festival. There was local band, Drops of Oil, Funky Steel, who had come across from Copenhagen, and three bands, Pan Young, Panoply and Panpaya, who had travelled over from Stockholm, Sweden. 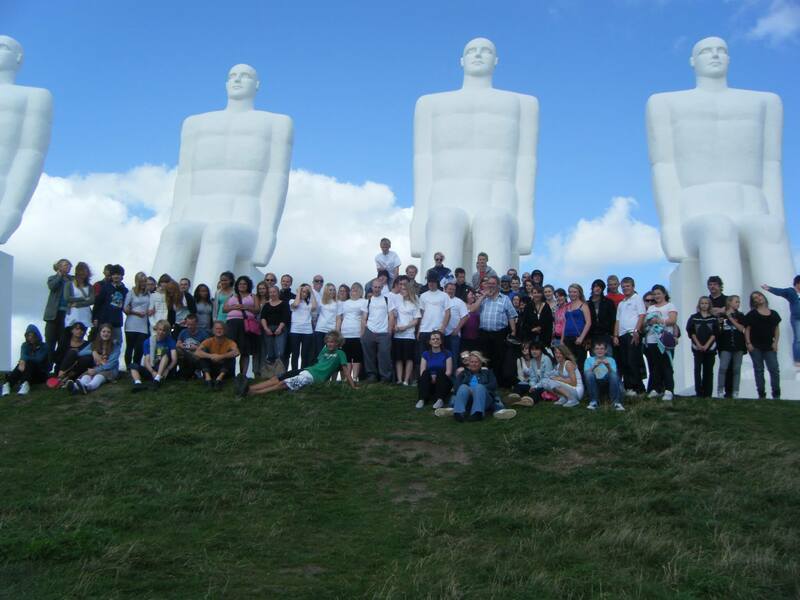 After an interesting morning we all moved on to the Fisheries and Maritime Museum at Esbjerg, and then to the Millennium Monument ‘Men at Sea’ for a group photo shoot where we were finally joined by Croydon Steel Orchestra who had recovered from their twenty hour drive over from England. The following day was the first opportunity for all the groups to get together to play for the first two hour steel festival in Torvet, Esbjerg. Each band took its turn for a twenty minute session and we were then invited to bring the afternoon event to a close to much applause from the international audience. In the evening a performance by the Rudy Smith Quartet had been arranged for all the groups to attend. Rudy is well known around the world for his steel pan playing in a jazz style and this gave all our players a new insight into what can be achieved with a tenor pan. Saturday needed an early start as we all had to be on the Esbjerg Harbour side by 9.00am to set up for the next day of the Steelband Festival. Sixty Cultural Containers had been spread out around the harbour for an exhibition and sale of local arts and crafts. We were all fitted in the areas between the containers and, with Funky Steel playing on the local museum lightship, another morning of steel music got underway. The band running order was the same and we finished off the morning with an extended spot that concluded with our famous breakdown to a clear stage (well roadway!). There is nothing steel pan players like to do more than get working together and the afternoon was spent doing just that. Esbjerg Kulturskole was the venue for a mass workshop with around seventy players and all their pans jammed into the hall. Our MD Steve Marshall ran the first session teaching everyone Sunchyme and this was followed by Paul Dowie, MD at Croydon, getting all the group up to speed with St Thomas. The noise was unbelievable but the end result was outstanding to hear so many players achieve two complete tunes in a three hour session. The three days came to a close with a social evening at Rorkjaer youth centre, and then it was a farewell to all the new friends that everyone had made over the first Esbjerg Steel Band Festival. We have to say a big thank you to Mogens Kiesbye who put the music side of the festival together, and also to all the other bands and their organisers who made this such a memorable event. But, although the other band’s players went home on Sunday, we were just about to start on a week of steel music concerts around the west of Denmark. The first event was at the Hvidbjerg Holiday Centre at Blavand where the caravanners and campers joined in the teatime fun of a live band. The following day was an opportunity to take some time out to relax. Whilst several of the group went to Esbjerg to try their hand at GoKarting, the rest stayed in Ribe and hired bikes, canoes and rollerblades to take them around the town. Monday evening was to include a short performance at Ribe Byferie so our other holidaymakers could see what we were about. We also planned a barbeque and campfire for the group to mix in with the playing. Rain put paid to the performance but being a hungry crowd, nothing was going to stop them feeding and sitting around the fire until the late evening. Tuesday turned out to be another relaxing start with our only performance being at teatime at the Bilka Hypermarket in Esbjerg. Wednesday started with a great performance outside the Domkirke in Ribe over the lunchtime and early afternoon. Another international audience brought kroner, euro and pounds into our collection buckets and CD sales. We said goodbye to our MD Steve, who had to get back home, and then moved on to Torvet Esbjerg where we had arranged to play in the evening outside the Queen Louisa pub. We returned to the Esbjerg Seminariet the following day, where we had done a workshop with students on our first visit back in 2007. This time it was just for a lunchtime session in the dining room, but with few customers, we cut the event short and headed, via the beach, for another session at the Fisheries Museum. It was beautiful sunny day and most holiday makers had also headed for the beach so once again we had a small audience but the staff were very supportive and the ice creams were welcome at the end. The weather seemed to be settled until we set up to try and play again at Ribe Byferie. You could see the black storm clouds coming in from the sea and after fifteen minutes it was all hands to the cases to get the pans covered and finally put away between the thunder and lightning. Our last playing day took us north to the town of Varde where we set up in the main square for a couple of hours of music and some welcome cold drinks on yet another warm day. We left Varde to return to Ribe for our final venue at Ribe Camping. Playing in front of a very appreciative group of holidaymakers we had probably our best event, finalising once again with a breakdown to the rapturous applause of the audience. Even the final day gave us time to take in Esbjerg town centre, the bowling alley and crazy golf before we headed for the flight back to Birmingham and an eventful motorway journey home for some of us that we wont go into here!!! Our thanks must go to all those who helped to make this holiday great but especially the youth workers at Esbjerg Kommune – Leif Buster Hansen, Orla Sorensen, Thomas Jorgensen and again Mogens. Also to all the people who invited the Orchestra to play at their venues and provided us with so many meals that helped our holiday budget, and to the staff at Ribe Byferie and finally the guys who helped us on the M6.